We have contributed fundamentally to the characterization of the non-canonical member of the PIN family of auxin transporters, PIN6 1. In contrast to either plasma membrane (PM)-localized PINs with long central hydrophilic loop facing to cytosol or the membrane of endoplasmic reticulum (ER)-localized PINs with very short central hydrophilic loop facing the cytosol, this PIN-type protein has been shown to localize to both PM and ER. This dual localization of PIN6 seems to correspond to its medium-size central hydrophilic loop. We have performed transport and auxin metabolic profiling assays in suspension-cultured cells and revealed that PIN6 is involved in both auxin transport across the PM and control of the intracellular auxin homeostasis. These findings indicate a unique position of PIN6 within the PIN family of auxin carriers and show how complex the mechanism of control by auxin of various developmental processes is. We have characterized the modulation of auxin transport and auxin metabolic profiles in relation to the mode of action of selected intermediates of phenylpropanoid metabolic pathway, namely derivatives of cinnamic acid. We have shown that 3,4-(methylenedioxy)cinnamic acid (MDCA) 2 as well as cis-cinnamic acid 3 inhibit auxin efflux from cells, thus adding novel compounds among native, endogenous auxin transport inhibitors and shedding light on allelochemical properties of such substances. Moreover, MDCA can interfere also with both phenylpropanoid and auxin metabolism, thus modifying intracellular homeostasis of auxin and relevant phenylpropanoids 2. In contrast to the above-mentioned derivatives of cinnamic acid, we have also characterized action of flavonols on auxin homeostasis and contributed to the study revealing that flavonols rhamnosylated in position 7 interfere with auxin metabolism but not with auxin transport 4. We have also contributed significantly to further characterization of the nitrate transceptor (transporter&receptor/sensor) NRT1.1. In the continuation of our previous work showing the auxin-transporting activity of NRT1.1, we have characterized the role of NRT1.1 by testing the auxin transport of mutated versions carrying point mutations in the phosphorylation site at amino acid residue T101 5. We have shown by 3H-IAA uptake assays that it is the phosphorylated form of NRT1.1 (T101D) that is responsible for its auxin-uptake activity and that this function is needed for the repression of lateral root emergence under low NO3-. Using biochemical approach, we have characterized the binding of auxin to the putative auxin receptor, Auxin-Binding Protein1 (ABP1). Even though genetic studies have not confirmed an important role of ABP1 in regulation of developmental processes, this protein binds auxin with high affinity and specificity. In concert with this, and using several abp1 mutants with substitutions in the metal core or in the hydrophobic amino acids of the auxin-binding pocket and neutral mutations, it was shown that the ABP1 auxin-binding pocket is crucial for acquiring developmental roles of ABP1 and activating the downstream elements of the ABP1 signalling pathway 6. Within the field of cell biology of auxin carriers, we have uncovered their differential dynamics within the PM 7. Using raster image correlation spectroscopy (RICS) in suspension-cultured tobacco cells and fluorescence recovery after photobleaching methods, we have shown that the mobility of AUX1 auxin influx carrier is lower in comparison with the mobility of PIN1 auxin efflux carrier. Interestingly, PIN1 mobility within the PM has been shown to be dependent on cytoskeleton in contrast to AUX1. RICS, which is routinely accessible on modern confocal laser scanning microscopes thus represents a valuable approach for studies of dynamics of PM proteins in plants. Laboratory also identified new tobacco homolog of adenosine ribosylation factor guanine-nucleotide exchange factor (ARF-GEF), NtGNL1a and shown its role in the endocytosis of PIN1 auxin efflux carrier 8. Within this work, screening of the effect of a spectrum of vesicle trafficking inhibitors was performed. Our data demonstrate the potential of tobacco BY-2 cells for selective mapping of ARF-GEF-regulated endomembrane trafficking pathways. Finally, we have co-edited a book summarizing up to date knowledge on the role of auxin in plant development 9 and summarized the current state of understanding of the native as well as synthetic inhibitors of plant hormone transport 10. Using in vitro cultured tobacco cells 11,12 and later also Arabidopsis cells 13,14 adapted for direct measurements of auxin flow through cells, we have revealed the involvement of cellular auxin efflux in the establishment of polarity of cell division 15. We have described the response of cytoskeletal structures and endomembranes to the inhibition of polar auxin transport and quantitatively characterized the action of some polar auxin transport inhibitors, NPA and BFA (Petrášek et al., Plant Physiol. 2003) and TIBA and PBA (Dhonukshe et al., PNAS 2007). We have participated on the discovery of inhibitory action of auxin on intracellular trafficking of proteins, including auxin efflux carriers from PIN protein family (Paciorek et al., Nature 2005). Then we have used tobacco cells transformed with Arabidopsis PIN genes and determined an array of kinetic parameters of auxin flow in these cell lines. Results obtained led to the conclusion that PIN proteins catalyse directly and with high specificity the transport of auxins from cells to intercellular space and they play a rate-limiting role in auxin flow (Petrášek et al., Science 2006). Working on the non-canonical member of the PIN family, PIN5, we have characterized changes in the metabolic profile of native auxin after overexpression of this protein and provided important evidence for the so far unknown function of intracellular auxin carriers (Mravec et al., Nature 2009). In the continuation of this effort, we have contributed significantly to the discovery of the, until then, unknown PILS (PIN-LIKES) family of putative auxin transporters that localize to endoplasmic reticulum. Changes in their expression result in changes in the spectrum of auxin metabolites in cells, thus determining the accessibility of free auxin to the nuclear auxin-signalling pathway (Barbez et al., 2012). However, not only PIN5 and PILSes are found on endomembranes. PIN8, which is expressed in the male gametophyte of Arabidopsis thaliana, plays a crucial role in pollen development and its functionality. PIN8 co-localizes with PIN5 on the ER and is also involved in the control of auxin homoeostasis and metabolism (Ding et al., 2012). Our auxin accumulation assays in transgenic tobacco also contributed to the characterization of the plasma membrane (PM)-localized auxin transporter AtABCB4 from the superfamily of ABC transporters, and in revealing its unique function: depending on intracellular auxin level, ABCB4 is able to transport auxin into and out of cells. This is the first finding of a bi-directional, ‘substrate’-concentration-dependent transport of a low-molecular compound across the PM in plants (Kubeš et al., 2012). The paper cited also provides a likely explanation for the herbicidal activity of synthetic auxin 2,4-dichlorophenoxyacetic acid (2,4-D). Studies of intracellular and plasma membrane dynamics of auxin carriers revealed the interaction between auxin efflux carriers PIN1 and PIN2 and dynamin-related proteins at the cell plate that is necessary for proper polar PIN positioning in interphase cells and, concomitantly, for auxin-mediated development (Mravec et al., 2011). 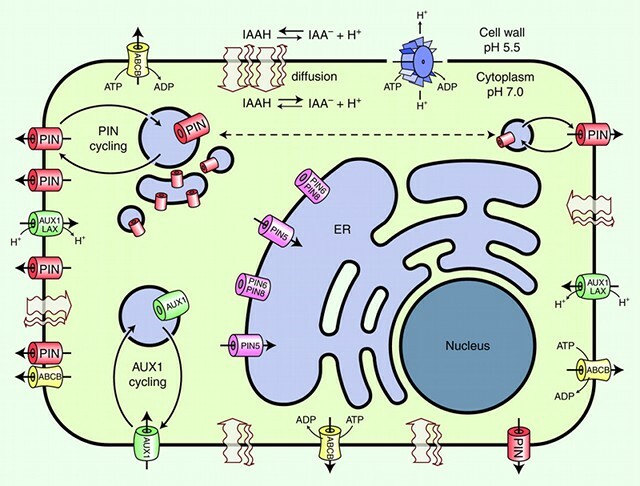 The analysis of reversible ubiquitylation of the auxin efflux carrier PIN2 that is important for PIN2 endocytosis and its delivery into the cell’s lytic compartment showed that such ubiquitylation, however, does not interfere with PIN2 auxin efflux activity at the PM (Leitner et al., 2012). Using tobacco cells we also showed that cytokinins regulate trafficking of auxin carriers on post-translation level (Růžička et al., PNAS 2009, Marhavý et al., 2011). Importantly, we also showed that ABP1 action at the plasma membrane regulates the dynamics of PM proteins the activity of PIN auxin transporters (Čovanová et al., 2013), supporting previous results obtained in tobacco cells (Robert et al., Cell 2010). We have taken part on characterization of molecular interaction between auxin transporters of PIN- and MDR/PGP/ABCB-type (Mravec et al., Development 2008), on elucidation of the function of proteins from AUX1/LAX and PIN families during Arabidopsis thaliana apical hook development (Vandenbussche et al., Development 2010; Žádníková et al., Development 2010), and on revealing the involvement of nitrate transporter NRT1.1 in uptake of auxin into cells of A. thaliana roots (Krouk et al., Developmental Cell 2010). We have isolated and characterized the gene PaLAX1 from Prunus avium (Hoyerová et al., Plant Physiol. 2008) and we study properties of the corresponding protein. We have contributed to the knowledge on so-called auxin influx inhibitors and pointed at distinct mechanism of their action (Laňková et al., Journal of Experimental Botany 2010). We also pointed at several, so far unknown side effects of FM-dyes which are widely used for investigation of membrane dynamics (Jelínková and Malínská et al., Plant Journal 2010). On a metabolic level, we have contributed significantly to characterization of the role of major auxin degradation product, 2-oxindole-3-acetic acid (oxIAA), in control of auxin homeostasis (Pěnčík et al., 2013), and to better understanding of the mode of action of some auxin transport inhibitors (Yin et al, 2014). Using a number of auxin analogues, the Laboratory determined their physiological activity, and investigated their modes of action. The results demonstrated similar but not identical structure-activity relationships, and highlighted some synthetic auxin analogues that display non-canonical behaviour. Such compounds can serve as useful tools for studies of distinct mechanisms involved in the auxin mode of action (Simon et al., 2013). We have published reviews on auxin transporters, their function and its regulation and about their role in plant development (Zažímalová et al., Cell. Mol. Life Sci. 2007; Křeček and Skůpa et al., Genome Biology 2009; Petrášek and Friml, Development 2009; Zažímalová and Murphy et al., Cold Spring Harbor Perspectives in Biology 2010; Petrášek et al., in Geisler M. a Venema K. (eds): Transporters and Pumps in Plant Signaling, Springer Verlag, 2011), about types of auxins themselves (Simon and Petrášek, Plant Science 2011) and about structure of eukaryotic plasma membrane (Malínská and Zažímalová, Current Protein and Peptide Science, 2011).